Left to right - Tigo Tanzania's Chief Officer for Mobile Financial Services - Hussein Sayed, Selcom's Executive Director - Sameer Hirji, Tigo's Managing Director - Simon Karikari, Mastercard's President for Sub Saharan Africa - Raghav Prasad and Mastercard's Country Manager - Anthony Karingi join hands to mark the launch of the new Tigo Pesa Masterpass QR digital payment system in Dar es Salaam today. 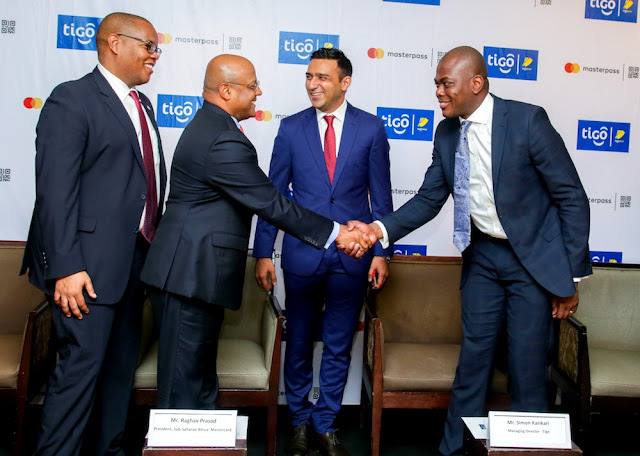 Customers can now simply and securely use the Masterpass QR digital payment system available through Tigo Pesa to pay for goods and services at over 1,000 merchant locations across the country, paving the way for cashless lifestyle in Tanzania. 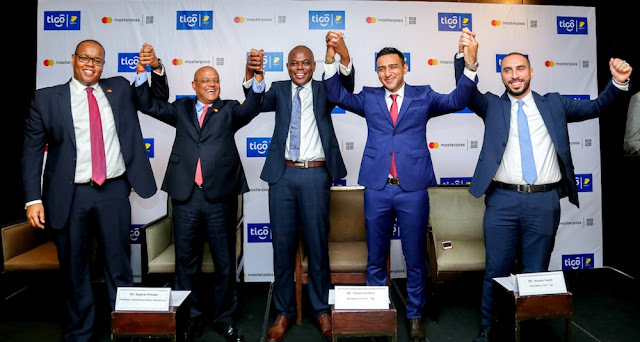 Tigo's Managing Director, Mr Simon Karikari (second right) exchanges a handshake with Mastercard's President for Sub Saharan Africa, Raghav Prasad (second right) to mark the launch of the new Tigo Pesa Masterpass QR digital payment system in Dar es Salaam today. 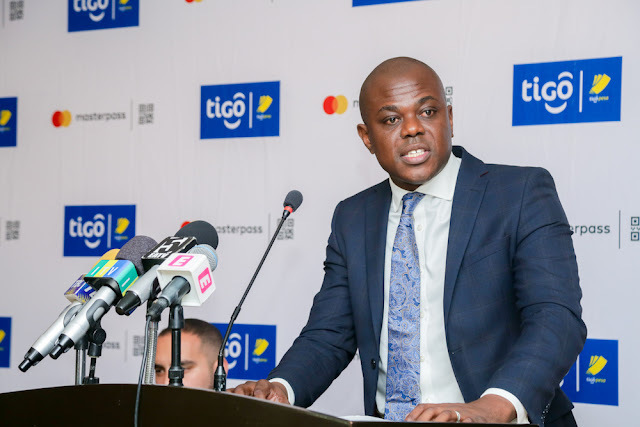 Customers can now simply and securely use the Masterpass QR digital payment system available through Tigo Pesa to pay for goods and services at over 1,000 merchant locations across the country. Looking on are Mastercard's Country Manager, Mr. Anthony Karingi (far left) and Selcom's Executive Director, Sameer Hirji (far right). Mastercard and Tigo announced today that Tanzanian’s can now use their TigoPesa app to make quick, easy and secure payments with Masterpass QR. 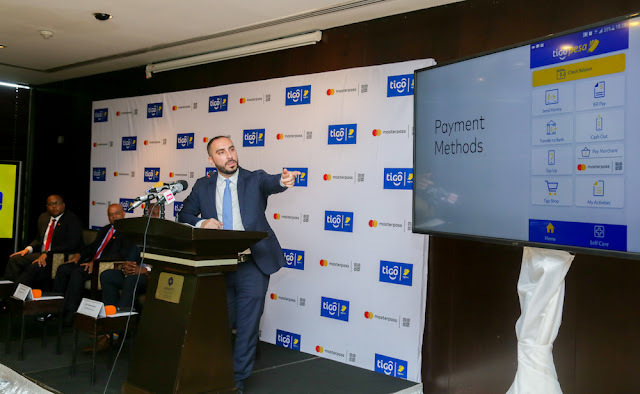 The interoperable QR (Quick Response) solution is now live and ready for Tigo consumers to use it at various stores, restaurants and retail outlets across the country. TigoPesa Masterpass QRremoves the need for you to carry cash or physical bank cards, so even if you forgot your wallet at home, you can make a payment using Masterpass QR.You are guaranteed the security of being able to pay for in-store purchases by scanning the QR code displayed at checkout on your smartphones, or by entering an 8-digit merchant code into a feature phone. “We are extremely proud to be the first and only mobile operator in Tanzania to offer this service to our consumers. Thisinnovation has come at the right time as we are broadening our Tigo Pesa ecosystem. We envisage Tigo Pesa becoming afully-fledged financial service provider where customers are able to perform a variety of transactions. 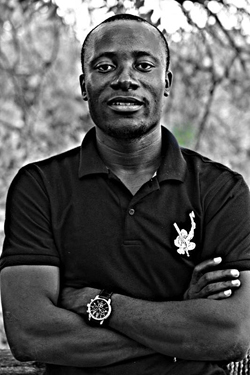 With millions of Tanzanian’s preferring to use their mobile devices to pay for goods and services Masterpass QR will provide them with a fast, easy to use and secure way to pay for goods and services,” says Simon Karikari, Managing Director, Tigo Tanzania.